Huge torrents of brown, muddy, foaming water cascade over the precipice and freefall 90 metres, thundering onto the rocks below. A plume of white spray fills the air. The spray building higher and higher is mesmerizing. The noise is deafening. We shout at each other and we are only centimetres apart. The spray relentlessly rises, now well above us. The swirling white mist is now 50 metres over our heads. Suddenly the huge volume of water in the air creates its own wind squall, changes direction and then deluges us as it drops back into the chasm. Screams of surprise and delight erupt around the now saturated, awe-inspired crowd. This is The Devil’s Throat (Garganta del Diablo), the centrepiece of the mighty Iguazu Falls, located on the border of the Brazilian state of Paraná and the Argentine province of Misiones. This 100-metre-wide semi circular stage plays to enthralled audiences 24 hours a day, 7 days a week. We are perched on a platform right on the edge, at the top of the awesome monster, peering down into the boiling cauldron. The enormous power and energy created by this one section of the falls make one realize how insignificant we are. This is nature at its wildest best. On boarding the boat below the falls it was just a little disconcerting to see most people take their clothes off down to their bathing suits and put them in the waterproof bags provided. We had raincoats. The boat held about 30 people and the skipper took us very close to many sections of the almost 3-kilometre-wide falls for fabulous camera shots. Then the call came, no more photos, cameras away. The skipper gunned the twin stern drive motors and we rocketed right into the path of the waterfall. Visibility zero. Water cannoned down from a huge height and dropped straight into the boat amid screams of shock from the passengers. The rock face of the waterfall must have been centimetres away, but it couldn’t be seen because of the deluge. It was like being under water. Then the roar of the motors again and suddenly we were out and water was cascading out the bottom of my coat. Not one dry spot! The girls in their bikinis were the smart ones. It was a very wet trip back but nobody seemed to mind in the 33°C (90°F) heat. 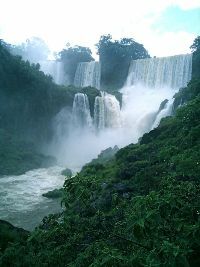 You can fly into Iguazu Airport in the Northern State of Misiones and stay at one of many hotels on either the Brazilian or the Argentinean side, some actually overlooking the falls. The Iguazu River here is the boundary between the two countries. 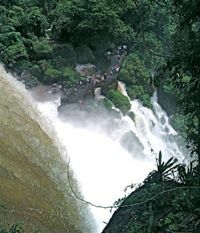 Eighty percent of the falls are on the Argentinean side but the best overall view of the Argentinean side is from the Brazilian side. So you need two days to do justice to the falls. 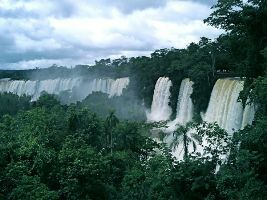 They are one of the seven natural wonders of the world.